Autism spectrum disorder (ASD) is a neurodevelopmental disorder characterized by impairments in (a) social communication and (b) restricted and/or repetitive behaviors or interests that varies in severity of symptoms, age of onset, and association with other disorders. ASD is both highly heritable and highly stable across age. Although improvement in symptoms is often observed between childhood and adolescence/ adulthood, longitudinal studies have found that individuals diagnosed with ASD rarely move off the spectrum and that symptom severity does not change significantly over time. Similarly, high stability has been found when autistic traits are measured in the general population. Despite extensive research into the causal influences on autistic traits at individual ages and the finding of high stability in these traits, little is known about the overlap in genetic and environmental influences on autistic traits across age and the contribution of such influences to trait stability itself. Knowing this is important for understanding the developmental course of autistic traits and why autism behaviors appear to vary so little over time. A research study published in the Journal of the American Academy of Child & Adolescent Psychiatry investigated these questions in a general population sample of twins. More than 6,000 male and female pairs of twins were rated on a scale of autistic traits by their parents at 8, 9, and 12 years of age and by their teachers at 9 and 12 years of age. Autistic traits were assessed using the Childhood Autism Spectrum Test (CAST, formerly the Childhood Asperger Syndrome Test). The CAST was developed as a screening questionnaire for use in non-clinical settings (see Wilkinson, 2010). Data were analyzed using structural equation modeling. The results indicated that, consistently across raters, not only were autistic traits stable and moderately to highly heritable at individual ages, but there was also a high degree of overlap in genetic influences across age. Autistic trait stability was largely accounted for by genetic factors, with the environment unique to each twin playing a minor role. The environment shared by twins had virtually no effect on the longitudinal stability in autistic traits. The findings of the present study have important implications for understanding ASD. They suggest that autistic traits are not only highly stable across middle childhood, but that this stability is caused largely by genetic influences in both boys and girls. This implies that stability is a biological characteristic of autistic symptoms, as opposed to being due to shared environmental factors. A caveat! The results do not mean that all variance in the stability of autistic traits is caused by genetic influences, nor do they suggest that autistic traits are fixed and resistant to change. Although the environment shared by the twins had little influence on the stability of autistic traits, the unique environment of each twin, such as being in different classes at school or receiving differential parental treatment, did appear to play a modest role in the stability of autistic traits. Despite the importance of genetics, environmental influences and treatment/intervention could still have an effect on these characteristics. 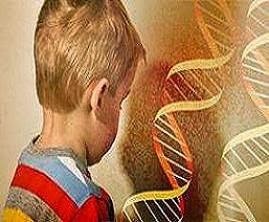 The results of this study add our knowledge of the key role that genes play in autistic traits and how these behaviors manifest themselves as children grow older. Overall, the findings suggest that the development of autistic traits in middle childhood is characterized largely by a set of stable genetic influences, but that, in addition to these influences, new genetic influences as well as modest-to-moderate environmental influences emerge at each age. Future research should include an examination of the specific nature of these causal influences on autistic traits across the lifespan. Likewise, the findings need replication in a clinical sample of individuals with ASD. Holmboe, K., Rijsdijk, F. V., Hallett, V., Happ, F., Plomin, R., & Ronald, A. (2014). Strong genetic influences on the stability of autistic traits in childhood. J. Am. Acad. Child Adolesc. Psychiatry, 53(2), 221–230. Wilkinson, L. A. (2010). Facilitating the identification of autism spectrum disorders in school age children. Remedial and Special Education, 31, 350-357. Lee A. Wilkinson, PhD is the author of the award-winning book, A Best Practice Guide to Assessment and Intervention for Autism and Asperger Syndrome in Schools, published by Jessica Kingsley Publishers. Dr. Wilkinson is also editor of a best-selling text in the APA School Psychology Book Series, Autism Spectrum Disorder in Children and Adolescents: Evidence-Based Assessment and Intervention in Schools and author of the book, Overcoming Anxiety and Depression on the Autism Spectrum: A Self-Help Guide Using CBT. His latest book is A Best Practice Guide to Assessment and Intervention for Autism Spectrum Disorder in Schools (2nd Edition).